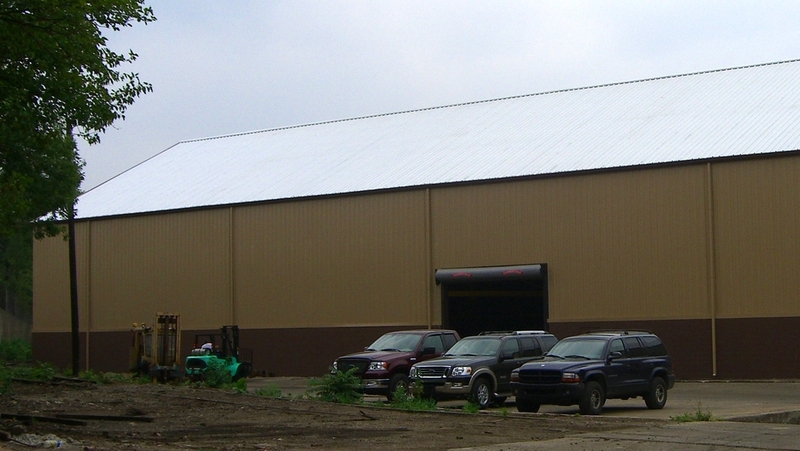 We, at Metalguard are metal building contractors providing complete metal building repairs. Roof and wall replacement, insulation replacement, structure repairs, painting, welding, etc. The above pre-engineered metal building renovation included; repairing steel columns and I beams (cutting and welding), replacing roof purlins, replacing wall girts, Cee channel, base angle, rat guard installation, metal roof replacement, metal wall replacement, doors, trim, and insulation. The project came in at 1/3 the cost of new construction. After a metal building renovation. Metal wall panel and metal roof panel replacement. Metal building renovation before metal wall panel and galvanized roof replacement. Metal building renovation after replacing wall and steel roof panels. Above, before the start of this renovation this steel building had seen better days. Notice, at the completion of the renovation below, the brick columns have been removed, man doors and overhead doors installed, and the roof tier has been removed so the new metal roof is all on the same plane. We have many years of experience of replacing the metal roof and metal wall panels on metal buildings. During the renovation process. The owner purchased this building to relocate his operations into it. To expedite the renovation we striped it to its structure and rebuilt it. At completion it was as if it was a new pre-engineered metal building. Below: The metal roof was repaired; skylights removed, rusted out panels replaced, and then the roof was sealed and coated. The interior was painted, electrical service was upgraded, the floor was coated. The insulation was renovated. New metal building white faced insulation was retro installed into the ceiling of this steel building, 8”. Building is located at the port of Houston, TX. 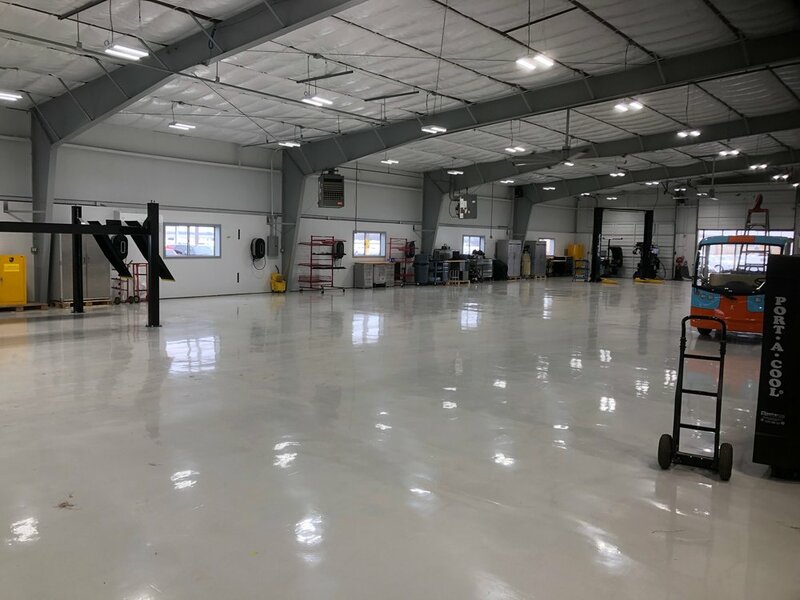 This metal building renovation with retro installed white faced insulation was completed February 2019. Location: Port of Houston. After, a new metal roof, metal wall panels, and interior insulation. The building now has a clean, updated look. Ready to be used for commercial, industrial, or warehouse activities. The factory painted panels include a 20 year manufacturer warranty. Each renovation is different, most renovations remain operational while work is being performed. Before, this building required constant maintenance. Above, before the metal building renovation, there was a gap between these two metal buildings. The buildings were connected and renovated. During the metal building renovation there was not a disruption in business. Interior renovation, before pictures can be difficult due to lighting challenges. Before this renovation this building had an outdated look. The windows were removed, and insulation added. A very strong wind storm, just outside the "windy city" (East Chicago, IN), blew off the metal wall panels that had been installed on this facility. Below, installing a new roof and walls on this building constructed with a steel pipe frame. This renovation required repairs and adjustment to the frame to accommodate the new doors. After the repairs the frame was painted white. How the underside of your roof looks might surprise you (below - top of metal roof panel). After the metal renovation. The cinder blocks and the end of the walls were cut to provide a clean finish and a 20 year maintenance free roof. After renovation, this is a result of a new metal roof and walls with new insulation, the new insulation helps bounce the light. The interior steel structure was also primed and painted. Above, after the metal wall panels had been removed. The renovation of this metal building included new steel structure. New wall girts and angle base, were welded onto the existing frame. The top 10ft. of the 40ft wall was cleared. Translucent panels were installed in this area. For the rest of the wall new metal wall panels were installed. There was no disruption in production during this renovation. Below: After the renovation this steel pipe frame building looked just like any other pre-engineered metal building. The bottom (facing the inside of the building) of the metal roof panel - same panel, below. The panel didn't look too bad from the top, but the bottom is almost gone. Did you know that the great majority of the time the roof rusts-out from the bottom up? The reason is the underside of the roof is out of the sun and is stays moist for long periods of time after a leak starts. What might look ok from the top of the roof might be severely rusting on the bottom. Metal building renovations Houston, TX. Complete metal building repairs Houston, TX. . Also, Metal building renovations and repairs. Metal roof coatings.